Joy in Everyday Life expands the meditation experience to develop further kindness toward ourselves and others. Through our discipline of meditation, we can begin to touch our inherent confidence and open heart of basic goodness. As we go forward on the journey, joining gentleness with discipline leads to a sense of joy. This inspires us to live a life of bravery and freedom from doubt. As meditation practice deepens and we develop trust in our innate wakefulness, we can begin to discover the confidence to relate to whatever arises in our world. Optional material fee: Participants may purchase the book Ruling Your World by Sakyong Mipham Rinpoche, which we will use in this course. Please bring $20 to registration on the first day. This fee is NOT included in tuition. Please plan to attend each session of the program. The Way of Shambhala includes Shambhala Training programs I–V, with each training followed by an "In Everyday Life" course that expands upon what was offered in the training. Over the course of a year, these programs introduce the entire Shambhala path. This series offers a glimpse of the Shambhala vision of enlightened society by emphasizing how meditation can impact our daily lives—and from there, how the sanity of meditation can impact our community and our whole society. 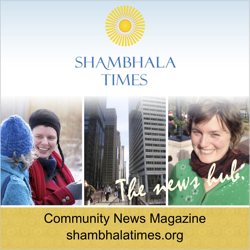 Please click here for a full description and chart of the Way of Shambhala. Joy in Everyday Life is the third of the five weekly courses that accompany the Shambhala Training programs. It is recommended either before or after Shambhala Training III. We are delighted that through sponsor support, we can offer subsidized pricing. If you are inspired to register as a sponsor, we thank you! If our pricing options aren't workable for you, please contact Danny Goldsmith, Director of Path and Service, at 303.444.0190 x104 or [email protected] at least three days in advance. We can make an arrangement which might include options for volunteer service—for which we also thank you!